Gabon is a French equatorial country, home to over forty ethnic groups. The largest group is the Fang, forming 40 percent of the population. Other major groups are the Teke, the Eshira, and the Pounou. As in many African countries, the borders of Gabon do not correspond to the borders of the ethnic groups. The Fang, for example, inhabit northern Gabon, Equatorial Guinea, southern Cameroon, and the western part of the Republic of Congo. The cultures of the ethnic groups are akin to other groups in Central Africa, and center around the rain forest and its treasures. Food preferences, farming practices, and quality of life are comparable. The ceremonial traditions vary, however, as do the personalities of the groups. There are ongoing debates about the differences in these groups and their significance. Location and Geography. Gabon covers 103,347 square miles (267,667 square kilometers). It is slightly smaller than the state of Colorado. 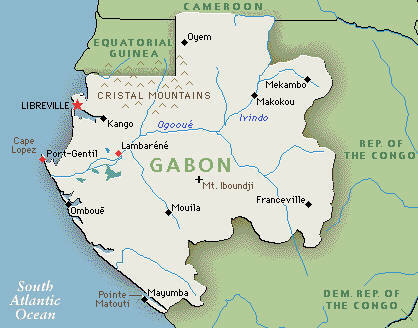 Gabon is on the west coast of Africa, centered on the equator. It borders Equatorial Guinea and Cameroon to the north, and the Republic of Congo to the east and south. The capital, Libreville, is on the west coast in the north. It is in Fang territory, though it was not chosen for this reason. Libreville ("free town") was the landing place for a ship of freed slaves in the 1800s, and later became the capital. Over 80 percent of Gabon is tropical rain forest, with a plateau region in the south. There are nine provinces named after the rivers that separate them. Demography. There are roughly 1,200,500 Gabonese. There are equal numbers of men and women. The original inhabitants were the Pygmies, but only a few thousand remain. Of the total population, 60 percent live in the cities while 40 percent inhabit the villages. There is also a large population of Africans from other countries who have come to Gabon to find work. Linguistic Affiliation. The national language is French, which is mandatory in school. It is spoken by the majority of the population under the age of fifty. The use of a common language is extremely helpful in the cities, where Gabonese from all of the different ethnic groups come together to live. Most Gabonese speak at least two languages, as each ethnic group has its own language as well. Symbolism. The Gabonese flag is made of three horizontal stripes: green, yellow, and blue. Green symbolizes the forest, yellow the equatorial sun, and blue the water from the sky and sea. The forest and its animals are greatly valued as well, and are portrayed on the Gabonese currency.